Landlord hereby leases to Tenant, and Tenant hereby leases from Landlord, the following described Premises upon the terms and conditions as set forth in this Lease Agreement ("Lease"). 1.1 PROVISIONS. The Basic Lease Provisions outline certain major terms which are supplemented by other Articles of the Lease. LANDLORD: Commercial Property Landlord, Inc. PREMISES: The ______ Floor of the office building located at ____________________ designated by diagonal lines on the floor plan attached hereto as EXHIBIT "A", containing rentable area of approximately ___________ square feet (the "Premises". Tenant's "Rentable Area" has been computed by adding to Tenant's useable area (measured from dominant face of exterior walls of the Premises to centerline of demising walls), Common Areas on Tenant's floor, and Tenant's proportionate share of the main lobby of the Building, but excluding vertical shafts, stairwells, and mechanical rooms in the basement which serve the entire building. __________________________ Dollars ($_____________) per month, commencing ________________________ through _______________. PARKING RENT: _______________ Dollars ($_____) per month for non-designated spaces and ___________ ($_______) per month for designated spaces during each year of the Lease Term, adjusted as set forth in Section 5.1.4.2 in the event of exercise by Tenant of the option described in Section 4.2. Parking Rent shall be _______________ Dollars ($__________) per month during the initial term ($__________ for designated spaces and $___________ for non-designated spaces). EXPENSES: ___________ divided by ________ equals _____%. 3.1 THE BUILDING. As used herein, the term "Building" shall mean those areas of land and the improvements, landscaping, parking, pedestrian walkways, and other features commonly referred to as ________________, located at common address ________________________. The Building may be altered, or expanded from time to time by Landlord, provided that no such alteration shall materially affect Tenant's use of the Premises, parking, or access thereto, or decrease Tenant's rights or increase Tenant's obligations hereunder. 3.2 PREMISES. Landlord hereby leases to Tenant and Tenant hereby leases from Landlord, for the Lease Term, at the Rent (as such terms are hereinafter defined), and upon the terms and conditions hereinafter set forth, the commercial office space described in the Basic Lease Provisions designated by diagonal lines on the Floor Plan attached as EXHIBIT "A" hereto, and incorporated by reference herein (the "Premises"). 3.2.1 The Rentable Area of the Premises set forth in the Basic Lease Provisions and the location delineated on EXHIBIT "A" are approximations. Landlord makes no representations as to the exact rentable square footage or location. By occupancy of the Premises, Tenant acknowledges that it has inspected the Premises and that the area so inspected is the area hired by Tenant pursuant to the terms of this Lease. 3.2.3.4 The right to install, maintain, use, repair, and replace pipes, ductwork, conduits, utility lines, mechanical rooms, and wires in the areas reserved by Landlord, subject to the limitations set forth in this Section 3. 3.2.3 Landlord agrees that where possible all work in the Premises shall be performed in a manner which shall not unreasonably interfere with the normal business operations of Tenant. 3.2.4 The Premises have been improved with certain leasehold improvements. Responsibilities and procedures for completion of future improvements (the "Improvements") as set forth in the Tenant Improvement Exhibit attached as EXHIBIT "B" hereto and incorporated by reference herein. Improvements to be completed by Tenant are hereinafter referred to as "Tenant's Work". Tenant shall abide by procedures and regulations set forth in the Tenant Improvement Manual for construction of the Improvements. The failure to comply with such procedures or regulations on a timely basis shall constitute a breach of this Lease. In the event Tenant exercises the option referred to in Section 4.2, Tenant may, based upon market conditions, be entitled to reimbursement for certain tenant improvements. In such case, any amounts due Tenant shall be credited ratably over the first year of the option period as provided in the Tenant Improvement Manual. 3.2.5 Landlord shall be required to complete any improvements to the Premises required by State and local municipalities to bring the Premises in compliance with the Americans with Disabilities Act and/or state and local fire and life safety laws. Landlord shall also thoroughly clean Premises prior to Tenant's occupancy. Landlord shall replace broken and/or missing ceiling tiles and carpet tiles with substitutes reasonably available in the marketplace. It is understood that due to the age of the existing improvements that there may be variances in color. Except for such requirements and punch list items addressed to Landlord in writing within thirty (30) days of occupancy by Tenant, Tenant accepts the Premises on an "as is" basis. 3.3 COMMON AREAS. The term "Common Areas" as used in this Lease shall be deemed to include those portions of the Building and other areas that are designated by Landlord from time to time for the non-exclusive use, convenience, and benefit of Landlord, Tenant, other Tenants of the Building, and other authorized users. Common Areas shall include, without limitation, exterior walls of the Building and appurtenances thereto, the main lobby from the parking garage to the Building, the parking garage, driveways, roadways, sidewalks, stairways, service bay, pedestrian walkways, elevators, landscaped and planted areas, open and enclosed courts, museum pieces, artwork, artistic displays, and landscape and pedestrian easements on public right-of-ways. The use and occupation of the Premises by Tenant shall include a revocable license to use in common with others entitled thereto Common Areas as may be designated by Landlord from time to time revocable upon breach by Tenant and Tenant's failure to cure such breach within the applicable cure period. Landlord reserves the right at any time to relocate the automobile parking areas and other amenities in the Common Areas and the identity and type of tenancies, subject to the limitations otherwise set forth herein. Tenant's use of Common Areas shall be subject to the provisions of this Lease, rules and regulations described in Section 7.3 (the "Rules and Regulations"), attached as EXHIBIT "C" hereto and incorporated by reference herein. 3.4 RESTRICTED COMMON AREAS. "Restricted Common Areas" shall include areas of the Building designated by Landlord from time to time as Restricted Common Areas. Landlord may restrict certain areas of the Building from free entry by Tenant or its agents, such as mechanical rooms, or similar areas required for the orderly management and maintenance of the Building, or which are considered unsafe or inappropriate for unrestricted entry and use. 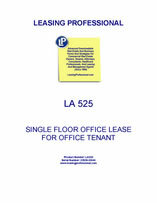 Restricted Common Areas not freely accessible to Tenant or its agents may nevertheless be serviced as a part of the cost of maintaining Common Areas, provided that Tenant shall have no liability for (i) such services, except for its Proportionate Share of Operating Expenses set forth in Section 5.2 and (ii) liability for the negligence, omissions, and willful acts of its employees, agents and contractors otherwise set forth herein. 4.1 LEASE TERM. The "Lease Term" shall be the number of months specified in the Basic Lease Provisions and shall include any extension, renewal, or holdover thereof. The Lease Term shall commence on the earlier of the date when Tenant takes occupancy of the Premises or the Anticipated Commencement Date specified in the Basic Lease Provisions ("Actual Commencement Date"). Notwithstanding the foregoing, Tenant shall be granted the "Fixturization Period" specified in the Basic Lease Provisions to complete alterations to be made by Tenant ("Tenant's Work"). In the event that Landlord does not deliver the Premises to Tenant in time to allow Tenant the full Fixturization Period, the Anticipated Commencement Date shall be extended by the number of days of such delay so that Tenant will have the full Fixturization Period to complete Tenant's Work. If the Actual Commencement Date falls on other than the first day of the month, the Lease Term shall be extended by the number of days between the Actual Commencement Date and the first day of the following month. A "Lease Year" shall be each twelve (12) month period, starting with the first day of the first full month of the Lease Term, and each twelve (12) month period thereafter. 4.2.1 The option to extend shall terminate in the event that any time during the term of this Lease (i) Tenant failed to pay or caused to be paid within ten (10) days of written notice any Rent or charges required by the Lease to be paid; (ii) Tenant has abandoned the Premises; (iii) Tenant has failed to do or cause to be done any act, other than the payment of Rent or charges, required by this Lease, which breach is not cured within the applicable cure period, (iv) Tenant has caused, permitted, or suffered without Landlord's prior written consent, any act which requires the consent of Landlord under the terms of this Lease, or (v) Tenant has caused, suffered, or permitted any act of bankruptcy as defined under the terms of this Lease. 4.2.2 Tenant shall exercise its option to extend by delivery of written notice to Landlord not less than six (6) months prior to expiration of the initial Lease term. If written notice is not delivered within said time period, such option shall terminate. 4.3 CONFIRMATION OF ACTUAL COMMENCEMENT DATE. Tenant agrees to execute a supplemental agreement within thirty (30) days after receipt in the form set forth in EXHIBIT "D" attached hereto and incorporated by reference herein, which shall confirm the Actual Commencement Date. 4.4 LANDLORD'S DELAY IN DELIVERY. If Landlord has not delivered possession of the Premises by the Anticipated Commencement Date, Landlord shall not be liable for any damage caused for failing to deliver possession, and this Lease shall not be void or voidable, but Tenant shall not be liable for Rent as defined in Section 5.4, until the Actual Commencement Date. If Landlord does not deliver possession of the Premises to Tenant within one (1) month after the Anticipated Commencement Date, Tenant may elect to terminate this Lease by giving written notice to Landlord within ten (10) days after the expiration of said one (1) month period. 5.1 RENT. Tenant agrees to pay as Rent for the use and occupancy of the Premises, at the times and in the manner provided herein, on the first day of each month without set-off or deduction, except as expressly otherwise provided herein, commencing on the first day of the Lease Term, Base Rent specified in Section 5.1.1, Parking Rent, except as otherwise expressly provided herein, specified in Section 5.1.2, if applicable, Storage Rent specified in 5.1.3, if applicable, and Excess Expenses specified in Section 5.2. 5.1.1 BASE RENT. Tenant shall pay in twelve (12) equal installments during each Lease Year, monthly in advance, the Base Rent specified in the Basic Lease Provisions. Base Rent for the first month of the Lease Term has been delivered to Landlord upon execution and delivery of this Lease. If the Actual Commencement Date occurs on other than the first day of the month, Base Rent for the second month shall be prorated based upon the number of days remaining in the month and thirty (30) days. 5.1.2 PARKING RENT. Tenant shall pay in twelve (12) equal installments during each Lease year, monthly, in advance, the Parking Rent set forth in the Basic Lease Provisions. Parking Rent for the first month of the Lease Term has been delivered to Landlord upon execution and delivery of the Lease. Parking Rent shall be prorated and adjusted in the same manner as Base Rent under Section 5.1.1. Notwithstanding the Parking Rent set forth herein, Tenant by written notice delivered to Landlord at least ten (10) days in advance may, during the first four (4) months of the Lease Term reduce the number of parking spaces hired with a proportionate reduction of Parking Rent. Any such reduction shall be effective only on the Commencement Date or the first day of the month. 5.1.3 STORAGE RENT. If the description of Tenant's Premises includes a Storage Area, Tenant shall pay in twelve (12) equal installments during each Lease year, monthly, in advance, the Storage Rent set forth in the Basic Lease Provisions. Storage Rent for the first month of the Lease Term has been delivered to Landlord upon execution and delivery of the Lease. Storage Rent shall be prorated and adjusted in the same manner as Base Rent under Section 5.1.1. 5.1.4.1 Base Rent, Parking Rent and Storage Rent shall be adjusted at the inception of the option period to "Fair Market Rent" as hereinafter defined, but not less than the Base Rent for the immediately preceding period. Fair Market Rent shall be deemed to include an allowance for market tenant improvements for the extended term, which amount shall be credited against Base Rent during the first year of the option period as set forth in the Tenant Improvement Manual. Fair Market Rent and tenant improvements shall also take into consideration any reasonable and documented costs incurred by Landlord in relocating the data and telecom facilities for FEMA if Tenant elects to relocate. 5.1.4.2 Fair Market Rent for the Base Rent and Parking Rent shall reflect actual market rates prevailing in the __________ area and shall be based upon buildings and parking structures of a similar number of floors, square footage, floor sizes, quality, and age, taking into consideration all factors influencing actual market rates such as terms of rental escalation, base year, tenant improvements, and any other concessions. If the parties are unable to agree on the Fair Market Rent within three (3) months of written notice by Tenant of its intention to exercise its option to renew, each party may appoint a consultant who is a licensed broker in the State of _____________ with knowledge of the __________ market, each of which shall be instructed to arrive at an indication of Fair Market Rent for the Premises and parking. If such indications are within ten percent (10%) of each other, the average of the two shall become the Base Rent for the Premises and Parking Rent for the parking spaces. If the two consultants' indications of Fair Market Rent differ by more than ten percent (10%), the two consultants shall be asked to select a third consultant, and the average of the two indications of Fair Market Rent of the three consultants which are the closest in amount shall become the Fair Market Rent for the option period. Each party shall pay the fees associated with its respective consultant. Costs associated with the third consultant shall be shared equally between Tenant and Landlord.